Democracy Spring is led by its Interim National Coordinating Committee (INCC), a national leadership body charged with stewarding the DNA, directing national staff, and determining national strategic priorities and campaigns. Teri Brezner (right) is a member of the INCC at Democracy Spring and has played an active role since September 2016 in co-facilitating local trainings and supporting the Dec. 19 and inauguration national actions. Based in Washington, DC area for the last 11 years, Teri has worked to train local leaders and communities on social justice issues and social change movements in both the US and abroad. Teri is a first generation Guyanese-Canadian and became a naturalized US citizen in 2012. 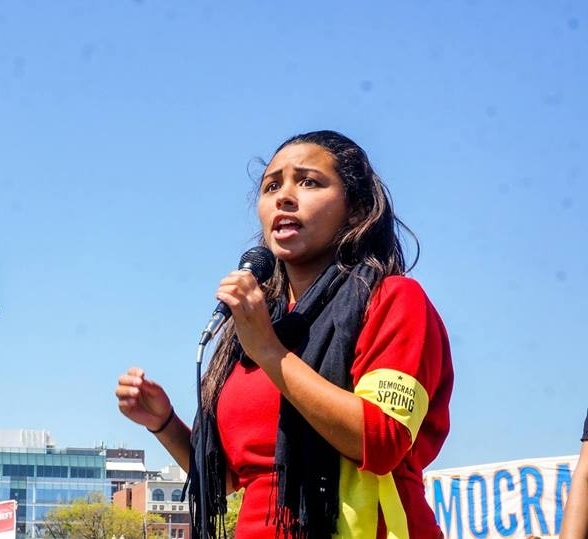 Teri joined the movement to end voter suppression and money in politics in 2016 after witnessing the role corruption and corporate money played in trying to silence the grassroots movement during the presidential election and the ongoing injustices of police brutality and mass incarceration of black and brown folks. She is fighting for a future with representative democracy, sustainable livelihoods and racial justice. Lola Ellis, current member of the Interim National Coordinating Committee for Democracy Spring. First generation Mexican American born and raised in Stockton, CA. Mother to a teenage daughter, inspired by the 99Rise March For Democracy in the Summer of 2014, she volunteered as a team leader for 99Rise in Sacramento, then served on the NCC of 99Rise and volunteered for and participated in the Democracy Spring coalition action of 2016. Kyle worked as a child life specialist on a pediatric burn and intensive care unit to meet the psychosocial needs of hospitalized children and their families. She holds a master’s degree in applied developmental psychology and is a Certified Grief Support Specialist, Returned Peace Corps and AmeriCorps Volunteer, and verified cat enthusiast. Kyle began organizing with 99Rise in 2013 and joined the Democracy Spring INCC following the 140-mile march and mass sit-in campaign of 2016. She is motivated to fight systemic corruption because of its toxic impact on healthcare, the environment, and the children she serves. She now lives in northern California. Tania is from Groton, CT and serves as Co-Mission Director. Tired of living in a system that taught her to say no to drugs, but not her uncle; tired of seeing her mom go through foreclosure even though she worked over 40 hours a week, and tired of endless doctors appointments that did nothing but treat symptoms without addressing the underlying problem. She was inspired by and joined the mass mobilization in April 2016 and joined Democracy Spring because she believes and knows that when big money is out and voting rights are protected for all, the people's voices, our voices, will be heard and followed. New to organizing, she has been committed to crafting her skills, listening and learning from those who have come before her, and satisfying her deep hunger for knowledge by attending trainings in organizing theories, management skills, relational work and more to come. Kai is a co-founder of Democracy Spring and served as our Mission Director from early 2016 to 2018. He grew up in West Virginia. A veteran of the movements for global justice, immigrants rights, worker rights, and universal healthcare, Kai helped launch 99Rise, the parent organization of Democracy Spring, in 2012 in Los Angeles, California. Three years after our historic April 2016 mobilizing launch where we demanded that Congress #FixDemocracyFirst, he stood behind congressional leadership (at the invitation of the Speaker of the House) for the pre-vote press conference and watched from the House Gallery during their vote to pass H.R.1, The For the People Act — a historic milestone (advancing virtually all of the pro-democracy countermeasures to “The 7 Deadly Sins of American Democracy”) which might not have been possible without the thousands that mobilized for and since Democracy Spring. Pearson is a 2011 graduate of Morehouse College and former Harvard University administrator and Social Engineer-in-Residence. He co-founded the Boston Democracy Circle (a heart and brain trust for local champions of democracy) with Frances Moore Lappé, helped to inspire the new support ecosystem for “Democracy Entrepreneurs” as a founding consultant, and now serves on the boards of Voter Choice Massachusetts (advancing ranked-choice voting) and Free Speech TV. He is featured in award-winning filmmaker Josh Tickell’s new book and film, The Revolution Generation: How Millennials Can Save America and the World (Before It’s Too Late). Andrea Perez is a member of the INCC for Democracy Spring and also serves on the board of the People’s Progressive Caucus of Miami Dade. Born in Colombia, she moved with her family to the country that promised the “American Dream,” a land where they could live, dream and aspire to a better life with no barriers. Later, she realized that that dream has failed not only those who immigrated to this country, but it has equally failed millions of Americans. She decided to join Democracy Spring and the fight to transform this nation, to fight for equality, take back our democracy and create a government that works for ALL of US. She first joined during the DNC protests, inspired by the 120-mile march on Washington earlier that year. She has participated in multiple actions, including our inauguration-day protest in Washington DC. She launched a training in Miami, FL where she resides. Curt is a co-founder of Democracy Spring and served as our Deputy Mission Director from early 2016 until early 2018. After returning from the Peace Corps in 2012, he began organizing with 99Rise in 2013. In 2016, he helped organize the 140-mile march and 1,300-person strong sit-ins at the US Capitol that launched Democracy Spring. He was born and raised in northern California and lives there now with his partner.